Simone Annie Liline Jacob (1927-2017) was born and raised in Nice, France. Just after finishing high school, her entire family was rounded up and sent to Auschwitz. Jacob’s mother, father, and brother perished in the Holocaust; two sisters survived. After being liberated from the camps, Jacob settled in Paris and studied law and politics. There, she met her soon-to-be husband Antoine Veil, with whom she would be married for 66 years. In 1956, she became a magistrate, and worked for the French Ministry of Justice, heading its penitentiary system. She was hailed for her role in dramatically improving prison conditions, and was known to regularly visit prisons on her days off. By 1964, Veil had become France’s Director of Civil Affairs. She worked tirelessly for women’s rights, and succeeded in finally getting French women full equality in legal matters. 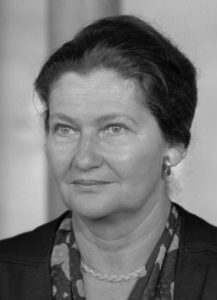 In 1970, Veil took over as secretary general of the Supreme Magistracy, then became Minister of Health in 1974, making her the first female minister in French history. Among her most famous laws was opening access to contraceptives, legalizing abortion (still known as “Veil’s Law”, which she intended only as a “last resort, for desperate situations”), and banning smoking in public areas. She also introduced maternity benefits, improved hospital conditions, enhanced the medical school curriculum, and worked to stop the illegal harvesting of organs from the deceased. Meanwhile, Veil worked for the European Economic Community, believing that a unified Europe was the only way to prevent another devastating war. When the EEC was reformed as the European Union, she was elected to its parliament, and shortly after, as its first president. She would serve on the European Parliament until 1993, in its Environment, Health, and Political Affairs Committees. Veil then returned to the French government, serving as Minister of State and Minister of Health until 1995. She continued her work in France and Europe until her last days, and faced a great deal of anti-Semitism throughout, including death threats and swastikas painted on her car and home. Not surprisingly, in recent years her greatest passion was Holocaust education, and she was president of the Foundation for the Memory of the Shoah. Among her many awards are the prestigious Charlemagne Prize, the Truman Award for Peace, the Legion of Honour, and the Order of the British Empire. In 2008, Veil became one of the forty “immortal” members of the illustrious French Academy. She also held 18 honourary degrees, including one from Yale and another from Yeshiva University. Sadly, Simone Veil passed away earlier this year, just shy of her 90th birthday. She was laid to rest with full military honours in the Pantheon, Paris’ famous mausoleum, alongside just 71 of France’s most cherished figures, including Voltaire and Rousseau. She remains among the most revered women in French history. I say that we should regard all men as our brothers. What? The Turk my brother? The Chinaman my brother? The Jew? The Siam? Yes, without doubt; are we not all children of the same father and creatures of the same God? This entry was posted in Law, Politics & Military and tagged Abortion, Charlemagne Prize, Europe, European Union, French Academy, French Jews, Human Rights, Judge, Lawyer, Legion of Honour, Magistrate, Member of Parliament, Minister of Health, Nice, Order of the British Empire, Pantheon, Paris, Social Justice, Truman Award for Peace, Women's Rights on September 27, 2017 by Jew of the Week. 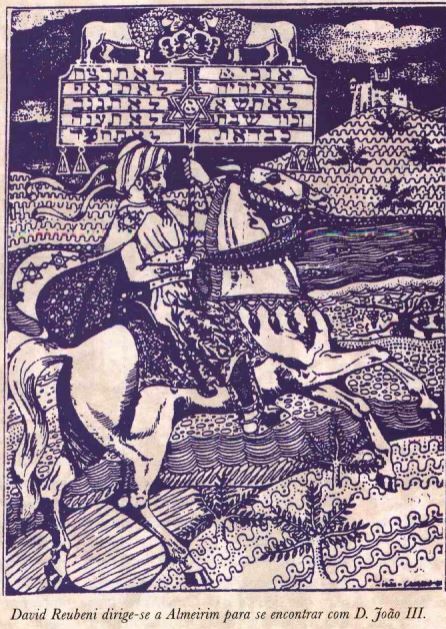 David Reubeni was born around 1490 in a place called Chabor – the location of which is disputed to this day, though the best evidence points towards Afghanistan, where certain Pashtun tribes still practice Jewish customs (despite being officially Muslim) and speak of a folk hero named Daoud Roubani. In 1522, Reubeni left on a long journey around the world, going to India, Africa, throughout the Ottoman Empire and Europe. Along the way he claimed to be a messenger from the distant Jewish Kingdom of Chabor. His wisdom, piety, and military genius were evident to all who met him, including the Pope and a host of other rulers and dignitaries. To these leaders he proposed a plan to conquer Israel from the Ottomans through a Jewish-Christian alliance. The plan gained a lot of steam, and even appeared to be manifesting at one point. Pope Clement VII supported it, and King Juan III of Portugal promised eight ships and 4000 cannons. However, the messianic fervour that resulted inspired some Jews to rebel against the Inquisition, causing the loss of key allies. Meanwhile, skeptical Jews joined anti-Semities and opponents in preventing what they felt was another “false messiah”, though Reubeni never claimed to be one. It was Emperor Charles V of Spain who eventually had Reubeni and his key supporters arrested. They were assigned to the Inquisition and never heard from again. Reubeni’s cause and time of death are unknown, though his diary survives in Oxford (a second copy was destroyed by the Nazis). His story is as fascinating as it is mysterious: a man with an unknown beginning and an unknown end, hailing from a lost Jewish kingdom, who nearly succeeding in reestablishing a Jewish state in Israel four centuries before the Zionist movement. A person must seek out a spiritual livelihood with all the intensity of his strength, just as he seeks a material livelihood. This entry was posted in Extraordinary Individuals and tagged Afghan Jews, Afghanistan, Africa, Austria, Chabor, Europe, India, Israel, Khaibar, Lost Tribes of Israel, Mizrahi Jews, Ottoman Empire, Oxford, Pashtun, Pope, Portugal, Sephardic Jews on September 4, 2013 by Jew of the Week.